He studied composition at the Folkwang-Hochschule with Nic. A. Huber and T. Neuhaus from 1998 - 2003 and with B. Furrer as a postgraduate in Graz 2003/04. He worked in several electronic studios, at IRCAM (Paris), ZKM (Karlsruhe), Centro di Sonologia e di Calcolo (Padova), the Akademie der Künste Berlin, the IEM (Graz) et al. He has had international performances with ensembles such as Klangforum Wien, Ensemble Modern, Ensemble Oriol, Thürmchen Ensemble and KNM. He received a scholarship for the Darmstädter Ferienkurse 2002, was grant recipient of the Akademie der Künste Berlin 2002/2003, a winner of Impuls ’05, took a scholarship from the DAAD for his studies in Graz and was a member of the international Ensemble Modern Acadamy. The Frankfurter Künstlerhilfe supported him in 2007. 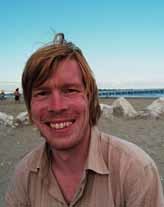 Hannes Galette Seidl has taught electronic music at the Folkwang Hochschule and at the Universität Bremen. Hannes Galette Seidl lives as a freelance composer in Gießen/ Germany.